We also have The Ladysmith King Suite available for rentals and one more Downtown Escape that will be posted very very soon. We aim to keep costs low for our guests so we ask that all visitors participate by leaving the units tidy, with dishes clean upon checkout. Cleaning fees will vary for weekly and monthly stays. Rates are subject to change until reservations are confirmed. Guests are responsible to clean their own dishes and leave the home is a clean state, otherwise additional cleaning fees will apply at a rate of $40/hour. Yard is to be kept clean of all pet waste. Visits exceeding 4 nights are subject to additional Cleaning Fees. My five star rating considers the value. This was a very well done conversion of an out building, and the surface finishes are very pretty and comfortable. The host was very responsive and flexible when we made inquiries. the house is a long walk or very short drive into town, and situated in a quiet neighborhood. Off-street parking right by the house. If you stay, go to the old town bakery for truly exceptional breads and pastries. It was a perfect stopover on our way up island after catching an afternoon ferry to Victoria. We will definitely stay again when we head North. Clean, compact tiny house. Much more comfortable than a hotel with a full kitchen and a comfy bed. Yard for dogs and a designated parking space. Lovely! Delightful little cottage...very clean and well appointed. Len (Jack) and Arlene F.
My wife and I stayed for two nights in August as we wanted to explore Vancouver Island. We are glad we found this on VRBO as it was perfect for our needs. 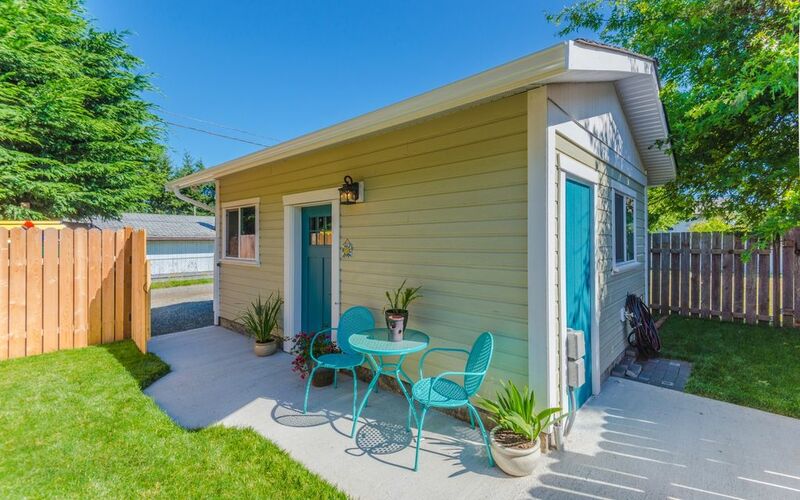 This stand-alone building located in the back yard has privacy and separate parking in the alley. This building appears to be brand new and has high end appliances and finishes inside. Very clean and had a comfy bed. We especially liked that it had a high efficient washer and dryer and we were able to do our laundry one evening while we relaxed and watched a movie on Netflix that is provided. This unit has an apartment sized fridge and stove with an eye level microwave. Everything you could need is provided in the kitchen, including a coffee maker and coffee / tea. The one thing that would have made this stay more comfortable is to have an air conditioner or at least a fan, as we stayed during hot weather and it got a bit warm. There are opening, screened windows so the unit cooled down in the evening. There is a market close by so we were able to get everything we needed. We would love to stay here again and would highly recommend this site.